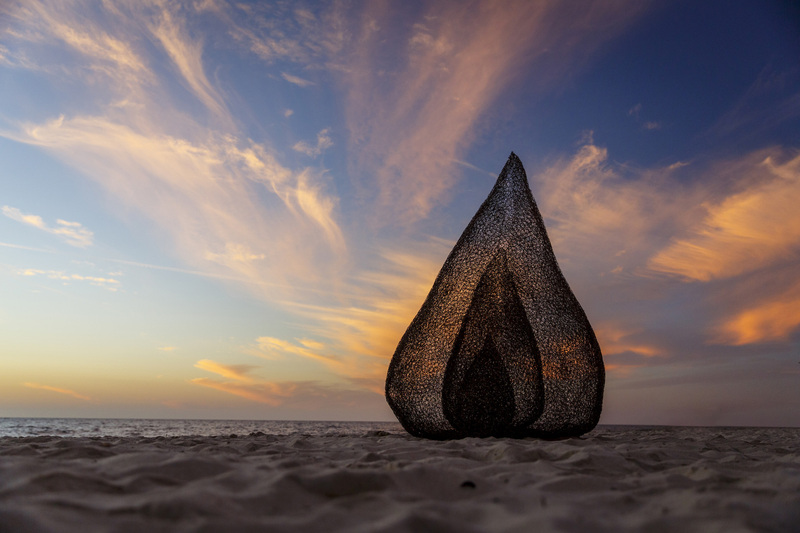 Sally Stoneman, ‘Flame’, Sculpture by the Sea, Cottesloe 2019. Photo Jessica Wyld. We, the following Western Australian artists (Perth and regional), who have exhibited in Sculpture by the Sea at Cottesloe, are dismayed the Department of Cultural Industries does not provide substantial funding for the annual Sculpture by the Sea, Cottesloe exhibition. We want to thank you, Minister Templeman, for the invitation to Sculpture by the Sea to apply for Organisation Funding for next year, as this is the only existing source of reasonable funding available from the Department, but some serious questions need to be asked. How is it possible the Department has taken 15 years to invite Sculpture by the Sea for major organisation funding? Given the importance of this event to the cultural life of Western Australians, how is it possible the Department has not been enthusiastic in its support of Sculpture by the Sea, the artists who exhibit and the extraordinary public response for 15 years? It is imperative that Western Australia does not lose this popular and important art exhibition. The overwhelming acceptance and sustained attendance each year by West Australians visiting the showcase validates its importance to both the visual arts and broader cultural community in WA. Reasonable funding is desperately needed and would be very greatly appreciated. It is unfortunate WA is not able to currently provide substantial commercial sponsorship as has been the case in the past but we and everyone we speak to believes the first organisation that should be funding and embracing Sculpture by the Sea is the Department of Cultural Industries. We have a world class hugely popular exhibition in Perth while other cities around the world pay millions of dollars for Blockbuster exhibitions in galleries – yet ours is on the beach, how fantastic is that! Many of these outdoor works are produced locally in WA using local material suppliers, arts workers, artwork fabrication houses, contractors and logistic companies. The exhibition artworks alone would extrapolate into hundreds of thousands of dollars of work for the local economy. The exhibition then generates further commissioned works with the same economic benefit. That’s what Sculpture by the Sea has done for us! All these benefits to WA would not be in jeopardy if the Department had recognised what the people of Perth recognised over 12 years go. Urgent action is required to make up for the Department’s inaction for so many years. We ask you to please ensure Sculpture by the Sea remains in Western Australia.